Community-Wide Blood Drive Come be part of something bigger than yourself and help those who are in need. 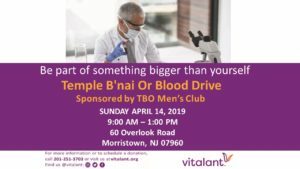 TBO Men’s Club is sponsoring a Blood Drive on Sunday, April 14, 9:00 AM – 1:00 PM. Questions? Contact Bob Goldstein. This entry was posted in Uncategorized on March 23, 2019 by Kim Lefferts.